I am writing to you on behalf of my son, Philip Brewer. 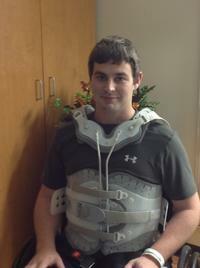 In November of 2012, Philip suffered a life-changing spinal cord injury in a motocross accident. Now paralyzed from the waist down, Philip has spent several weeks in medical and rehab facilities and will continue his rehab after a short break at home during the holidays. In spite of the many struggles that he faces, Philip remains hopeful that he will be able to return to a productive life in the community through the support of family and friends. We are making several home modifications so that he can come home permanently. Philip is currently in an intensive therapy program to strengthen his body and help him adjust to living with his paralysis. Philip may need to purchase a specially modified vehicle or modify his truck to provide him greater mobility and independence. The cost of a modified van could be as much as $65,000. Fees for home health care, rehab, and doctors’ visits are overwhelming. To assist with the costs of the van, home modifications, medical expenses not covered by insurance, and rehab, a fundraising campaign in Philip’s honor has been established with HelpHOPELive, a nonprofit organization that has been assisting the transplant community for 30 years. In 2000, they expanded their mission to include those who have sustained a catastrophic injury. All contributions are tax-deductible, are held by HelpHOPELive in the South-Atlantic Spinal Cord Injury Fund, and are administered by HelpHOPELive for injury-related expenses only. Won’t you please consider helping Philip realize his dream of an active life by contributing to his HelpHOPELive fundraising campaign? Your donation is greatly appreciated.Some of Philip’s friends are planning a fundraising event this winter/spring. We could certainly use your time and energy. Please email us at [email protected] to volunteer. We appreciate any support that you can provide to Philip and our family! Hi Philip. I'm Sandy and I work for your mom at TNCC. I'm thinking of you always. I just sent you a package which you should receive on about 5 December. We will continue praying for you and know that God will take care of you.